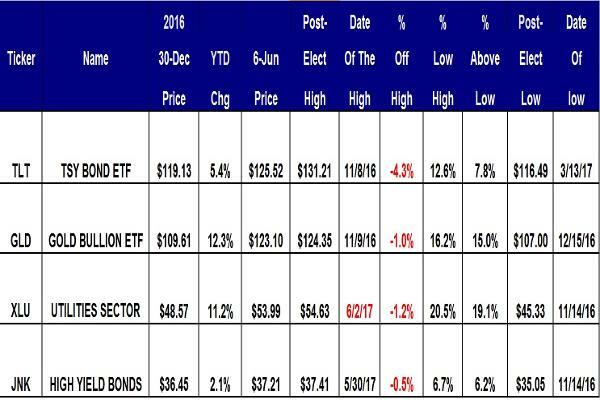 The 'flight to safety' exchange-traded funds for U.S. Treasury bonds, gold bullion, and dividend-rich utilities remain viable asset allocation choices for diversified investors. Investors continue to enjoy the "flight to safety" investments, which are headlined by the exchange-traded funds for U.S. Treasury bonds, gold bullion and utility stocks. The best investment for 30-year U.S. Treasury bonds is the 20+ Year Treasury Bond ETF (TLT . Gold bullion is best traded using the SPDR Gold Shares ETF (GLD . Investors seeking dividends invest in the Utilities Select Sector SPDR Fund (XLU . Investors interested in junk bonds trade the SPDR Barclays High Yield Bond ETF (JNK . Buyers beware that junk bonds tend to perform in tandem with stocks, not bonds, so investors should be cautious when stretching for yield. The junk bond ETF lags the other three "flight to safety" investment choices. Keep your eyes on the 200-week simple moving averages as these are the "reversion to the mean" for each of the exchange-traded funds. The "reversion to the mean" is an investment theory that says the price of an ETF will eventually return to a longer-term simple moving average. A logical choice that's easy to track is the 200-week simple moving average. 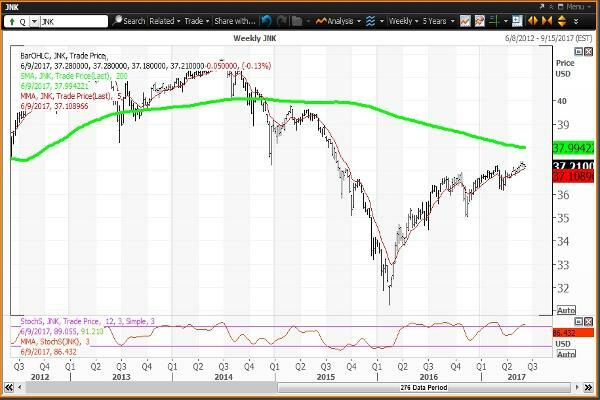 A ticker trading above its 200-week simple moving average will eventually decline back to it on weakness. Similarly, a ticker trading below its 200-week simple moving average will eventually rebound to it on strength. Read on to see the one intriguing chart on gold. Market Recon: The Market Is Telling You It Doesn't Trust the Federal Reserve -- Recession Lurking? The S&P 500 has a gain of 8.5% year to date, setting an all-time high of 2,440.23 on June 2. The U.S. Treasury bond ETF is up 5.4% year to date, and set its 2017 high of $125.87 on Tuesday. 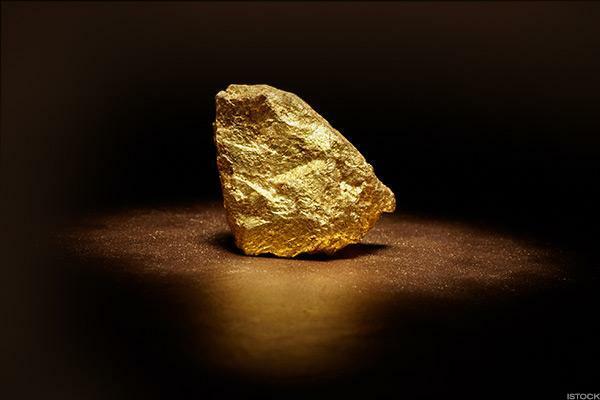 The gold bullion ETF has a gain of 12.3% year to date, setting its 2017 high of $123.31 on Tuesday. The utilities stocks ETF has a gain of 11.2% year to date and set its all-time high of $54.63 on June 2. The Junk Bond ETF is the laggard, up just 2.1% year to date. 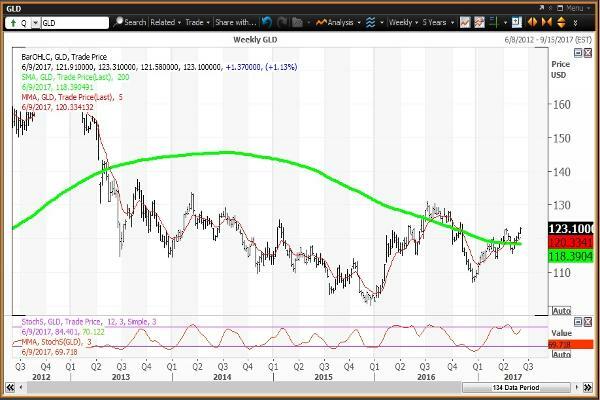 The yield on the 30-year U.S. Treasury bond traded as high as 3.215% on March 14 and on Tuesday, traded to a 2017 low of 2.793%, now below its 200-day simple moving average of 2.839% and its 50-day simple moving average of 2.948%. My semiannual value level is 3.302% with a quarterly pivot of 3.089% and a weekly pivot of 2.803%, which was tested at Monday's low yield. The U.S. Treasury 30-Year bond trades like a stock using the 20+ Year Treasury Bond ETF, which is a basket of U.S. Treasury bonds with maturities of 20+ to 30+ years. As a stock-type investment it never matures, and interest income is converted to periodic dividend payments. The weekly chart for the Treasury Bond ETF ($125.52 on June 6) is positive but overbought, with the ETF ending the week above its five-week modified moving average of $123.43. The bond ETF had been trading back and forth around its 200-week simple moving average of $120.97 between the weeks of Nov. 25 and May 12, as the "reversion to the mean." Weekly momentum is projected to rise to $81.42, rising above the overbought threshold of $80.00. Buy weakness to my quarterly value level of $120.23. My semiannual value level lags at $115.92. Sell strength to my weekly risky level of $126.06. Comex gold set its post-election high of $1,338.3 on Nov. 9, and then traded to its post-election low as $1,124.3 on Dec. 15. The 2017 high of $1,298.8 was set on Tuesday. 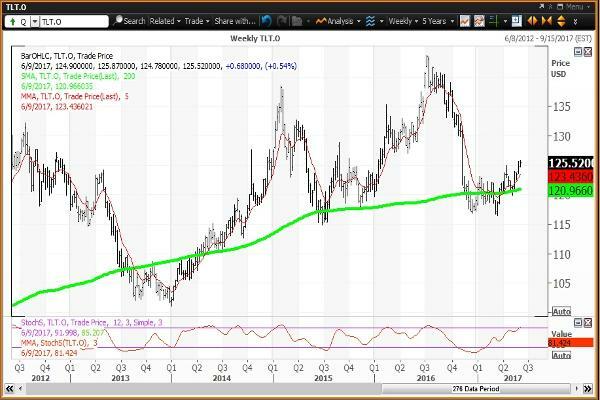 Gold has been above a "golden cross" where the 50-day simple moving average moved above its 200-day simple moving average on May 22. A "golden cross" indicates that higher prices lie ahead. My monthly value level of $1,152.6 with a quarterly pivot is $1,233.2 and a weekly pivot of $1,273.7. My annual risky levels have been $1,660.1 and $1,674.1 since the beginning of the year. Investors can trade gold like a stock using the SPDR Gold Shares ETF, which is backed by gold bullion. The weekly chart for the Gold Bullion ETF ($123.10 on June 6) is positive, with the ETF above its five-week modified moving average of $120.33 and above its 200-week simple moving average of $118.39, which is the "reversion to the mean" tested several times between the week of Feb. 24 and the week of May 19. Weekly momentum is projected to rise to $69.72 this week, up from $62.38 on June 2. Buy weakness to my weekly value level of $121.14. My quarterly value level is $116.89, with my annual risky level of $160.24. The Dow utilities set their post-election low of $616.19 on Nov. 14, and set a post-election high of $735.86 on June 2, which was a test of my semiannual risky level of $732.56. My monthly and quarterly value levels are $708.41 and $704.56, respectively, with a weekly pivot of $724.24. My semiannual risky level remains at $732.56. The weekly chart for the Utilities ETF (XLU ($53.99 on June 6) remains positive but overbought, with the ETF above its five-week modified moving average of $52.72. The ETF is above its 200-week simple moving average, or the "reversion to the mean" of $44.99. Weekly momentum is projected to remain above the overbought threshold of $80.00 at $89.38. Buy weakness to my monthly, quarterly and annual value levels of $52.43, $51.19 and $50.72, respectively. Sell strength to my semiannual risky level of $54.29, which was tested at the June 2 high. The High Yield Bond ETF (HYG is for investors betting that junk bond yields will tighten against U.S. Treasuries. Remember that the performance of junk bonds correlates more to the stock market, not to the bond market. The weekly chart for the Junk Bond ETF (JNK ($37.21 on June 6) is positive but overbought, with the ETF above its five-week modified moving average of $37.11. The ETF has been below its 200-week simple moving average since the week of Nov. 14, 2014, with the average now at $38.02. This "reversion to the mean" is now at $37.99. Weekly momentum is projected to end the week at $86.43, well above the overbought threshold of $80.00. Buy weakness to my semiannual and quarterly value levels of $35.14 and $33.00, respectively. My monthly and weekly pivots are $37.02 and $37.42, respectively. 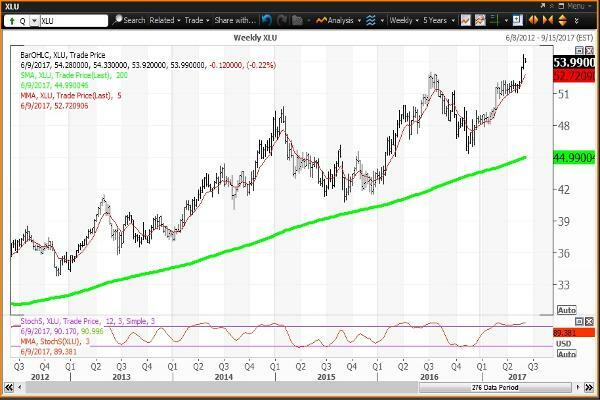 Sell strength to the 200-week simple moving average of $37.99.